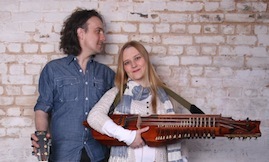 Formed in 2011 Gleowien is the education and corporate music adventure run by Vicki Swan & Jonny Dyer. Group workshops, individual music lessons, schools workshops, the Nyckeharpa UK project, weddings and corporate music for events such as medieval banquets. Vicki and Jonny both come from strong educational backgrounds with a versatilily to give individual lessons to full school workshops. They are both masters on their instruments and can perform in a variety of styles and occasions. Workshops with nyckelharpas provided enable participants to see if they like the instrument enough to take it up... they usually do. Book your workshop now. Vicki and Jonny's vast array of instrumental expertise mean that they can run any number of different workshops and give lessons on many different instruments. Any celebration including a Swedish element can be enhanced by Vicki's Swedish music. Authentic costume, song and drinking songs for any kräftskiva, julbord or wedding. VIcki & Jonny are fully tooled up for your medieval event, be it the opening of a playground or a full on banquet.